Historical volatility of returns measures the possible deviation of returns within a certain time period, relatively to the current price of an asset. So, if we say that the historical volatility of a stock is 45% annualized, this means that this stock might gain or lose 45% in value relatively to its current price within a year. Statistically this possibility is 68.2% for this to happen. The tool that is used to quantify the volatility of returns is the mathematical formula of standard deviation, which estimates the deviation of a set of observations (stock returns per day here) from their average. 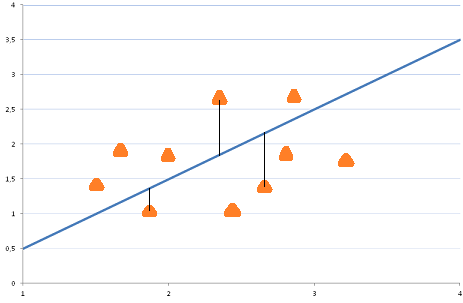 In the diagram below we can see the average (blue line) and the observations in orange. The mean distance of all the observations (i.e. stock returns) from their average is the standard deviation or in other words historical volatility. 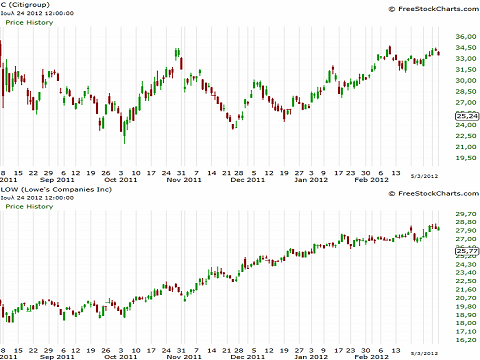 In order to grasp the notion of volatility, let’s look at the charts of two stocks which have about the same price. Almost every day the first stock is much more volatile than the second because its returns relatively to its previous day close price fluctuate much more. So, its annual historical volatility will be also higher. So, historical volatility in other words is a measure of the fluctuations in a stock returns within a year, based on observed data. This is an indication that the same fluctuations might happen in the future, i.e. the next year. Based on this indication we can estimate the possible upward or downward move of a stock with a possibility of 68.2%. Of course the predictive power of such a tool is in reality very low, because every year is different from its prior and consequently this can lead to completely different fluctuations in stocks returns than those estimated by historical volatility.